Might Our Children Visit Alpha Centauri? 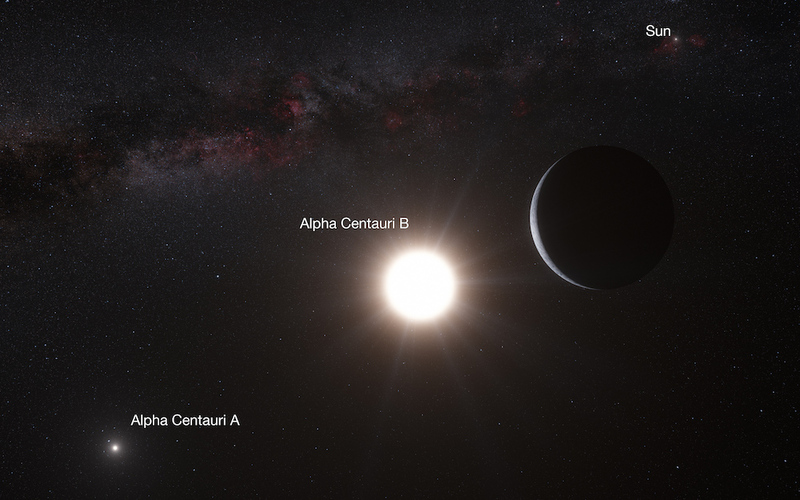 Alpha Centauri system with planet, artists impression (Image credit ESO/L. Calçada/N. Risinger). It has long been the dream of modern man to voyage amongst the stars, the popularity of space travel themed science fiction speaks for itself in respect to this dream. Sadly, as countless billions vanish into military research only a tiny fraction of that amount trickles into space research. For decades Earth’s space fleet has not moved on much beyond the craft and propulsion systems that were used during the 1980’s. The idea of human beings exploring the cosmos has remained a distant dream, at times even seeming to recede further away rather than moving closer. Just a couple of weeks ago I finished reading the space science fiction novel ‘Cauldron’ by acclaimed author Jack McDevitt. The book is largely about the collapse of Earths space program in the 23rd century, brought about by the belief that there is nothing more of interest within reach of the propulsion systems in use and that it is better to focus on the many problems on Earth, especially the environment. The parallel to our present situation is not accidental but is clearly an issue that the author has with current lack of progress and interest in space exploration. It is only thanks to a breakthrough in propulsion technology that the space program is saved and the book can then head of into pure space adventure, encountering a few alien races on route. It was then something of a huge personal synchronicity that just a few days after I closed the book, news headlines from across the globe were announcing a massive breakthrough in space craft propulsion systems technology. Humans of our day tend to think a little small in respect to space, which is perhaps because of the larger issue of public apathy in regards to this branch of scientific research. With that understanding in mind perhaps it should not be a surprise that the big statement associated with most of the articles was that we could potentially get to “the Moon in four hours”. Now, I am admittedly a little excited about the possibility of ships going back and forth to the moon in the same time it takes for me to drive to the nearest beach, don’t get me wrong about the incredible nature of that possibility. However, what really intrigued me was the less vaunted fact that should this EM Drive technology function as hoped on real spacecraft, we could conceivably send an exploratory mission to our nearest star, Alpha Centauri, and have it arrive in about 100 years. Sure that is still a pretty long time when contrasted against a human lifetime, but it is a just within the length of one long life. This means that in theory at least, a young astronaut could board a craft and live to see another star with their own eyes. Also we should take into account the potential for this technology to improve alongside advances in life extending sciences, even now there are some very well informed people claiming that with gene science advances we can already potentially extend our lives by centuries (if you have the money to pay for the treatments), perhaps up to as much as 500 years. It might be the case that our children, or grandchildren could make the journey and return home with the pictures. Alpha Cetauri is kind of interesting as stars go, it is actually a binary star system, which is not unusual in our galaxy with some 80% of systems being binary or trinary but would still make for an interesting view from a shuttle window. More importantly since 2012 observations of the system have suggested the possibility of one or two planets, the suspects are not in the habitable zone but as astronomer the Cambridge University astronomer, Brice-Oliver Demory (Phd Astrophysics) was quoted on the matter, “If you see one planet, the chance is there are other planets in the system.” It is a distinct possibility that a planet exists in the habitable zone, we might even find that when we come knocking our neighbours are home and ready for guests. 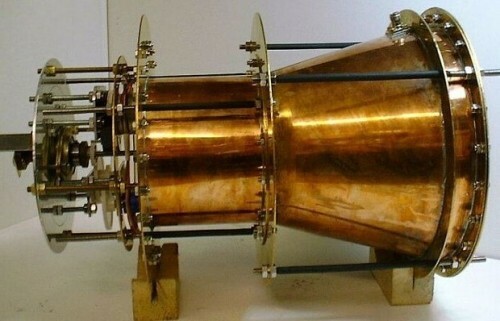 The EM Drive (Image credit: The Telegraph). Will the EM drive be fitted to ships any-time soon, we do not know. For now we just have a few technical specifications and a lot of heated debate over how and why these device works. The claim is that it produces thrust by using solar power to generate multiple microwaves that move back and forth in an enclosed chamber. This means that until something fails or wears down, theoretically the engine could keep running forever without the need for rocket fuel. The designation ‘EM’ is shorthand for electro-magnetic. The current scientific quandary is on how a drive that throws nothing out can propel anything forwards, it defies understood science. In my mind that is exactly the kind of breakthrough that sound hopeful though, surely we need technology that goes against the understood if we are ever to become an interplanetary species, flying around on rockets powered by fossil fuels is so ineffective that we don’t even attempt manned missions to the Moon anymore. Truthfully we won’t be able to explore our galaxy in the meaningful sense, until our drive systems can bend space-time itself with wormhole technology or some means that enables craft to ascend into higher dimensions of existence so as to completely avoid ‘physical’ space travel and its limitations. For now we have cause to be excited, the Moon might become a popular destination for science field trips and we may be able to offer a rethink for the Mars One project. Consider that the current plan involves the volunteers travelling for about 8 months to reach Mars, on a one way trip setting out in 2026. With the new drive looming on the horizon is may yet be the case that the mission could reach Mars in just over 2 months, this also means the idea of one way only may be rethought, certainly resupply and rescue missions would become real possibilities if NASA have a fleet of EM drive powered craft at their disposal in the next decade. Though things are in early stages of verification (despite the drive being invented 15 years ago by British researcher Roger Shawyer) there has been some independent verification already with Martin Tajmar, a professor and chair for Space Systems at Dresden University of Technology also finding that it does indeed produces thrust. Taking into account the apathy that has existed for decades, following the initial excitement of the manned missions to the Moon, this new drive may be our best hope for reigniting interest in the cosmos and taking humanity down a new course. The slogan for NASA might very well become, ‘Alpha Centauri, or bust’.